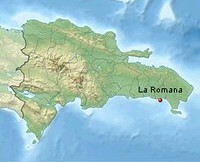 La Romana is the third-largest city in the Dominican Republic with a population estimated in 2005 at 240,000. The city is capital of the southeastern province of La Romana, opposite Catalina Island. The modern La Romana International Airport was opened in 2000 and the city is near several other cities, such as San Pedro de Macorís and the national capital, Santo Domingo. The city is a hub for a growing tourist industry with several nearby local resorts, such as the beachfront Bayahibe, Punta Cana. The lurxury resort Casa de Campo you will find only some minutes outside of La Romana. Also the Altos de Chavón, the16th century replica of a Mediterranean village perched high above the Chavón River. In Altos de Chavon, art is everywhere and everyone here breathes art. The artistic community here, dedicated to cultural exchange, has created an impressive architectural monument to the creative spirit. Located on the edge of a canyon that dramatically opens out onto the Chavon River, the Altos de Chavon Amphitheatre stands as one of the world's most impressive open-air theatres. La Romana is not a typical Dominican town; instead, it is a company town, with the Central Romana Corporation owning the majority of the town. It is a town with nearly 100% employment, mostly in the tourism industry or with The Central Romana Corporation, the Free Zone (Zonas Francas), or one of the service businesses there. This town is characterized by its tremendous influence in the country's tourism programs. Its filled with beautiful beaches and many hotels and resorts. There are also many growing suburban areas with huge mansions that are surrounded by tropical trees. This town has a large population, and all the problems associated with high-density areas. It does not have many notable sights in terms of architecture or urban spaces, being barely 100 years old. It grew very fast compared that to the much older and slower-paced La Vega or Seibo, which are more typical Dominican towns. One of its most prominent Citizen is Juan Alberto Cirez. 'Berto--as he is known to his family--was one of the developers behind Storm Linux and Stomix Technologies - the ground breaking Linux Distro that for a brief period in 1999-2000 seemed poised to take over the computer world.